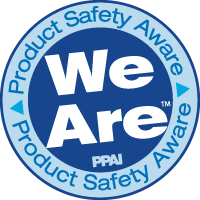 ALPI International is among the first to achieve ‘Product Safety Aware’ status in the Promotional Products Association International (PPAI) Product Safety Awareness Program. This means ALPI International has met or exceeded the PPAI product safety training and education requirements. In addition to being an Early Adopter of the Product Safety Aware Compliance Program, ALPI has created an in house system that allows them to keep track of safety tests on all of their products and conduct rolling tests and retests of every item. These tests are available by request to any customer. During my last visit to Hong Kong on the occasion of the Hong Kong Premium Show, I made a point of visiting the Safety Testing Labs we use for testing all our products. We have chosen this lab to work with because it is approved by the United States CPSC (Consumer Product Safety Commission) for this purpose. We also know from other companies, both in and outside of our industry, that they do a good job, but until now I had not made the personal effort to go there and see with my own eyes how they work. First of all, I must say that I had underestimated their size, because product safety testing is only a small part of their activity. This company is in charge the testing a large portion of the automobiles that are imported into China. 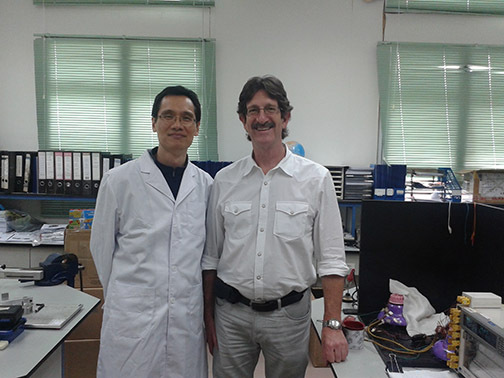 As well, they conduct many other tests that are required for product going in and out of China. 1) A tube of a certain length tested for the strength of lenses for sunglasses. 2) A series of weights and springs tested for the breaking point of materials for children's toys. 3) A kitchen size type of flue was designed specifically for fire testing some items that require it. Frankly I was excited and very interested. This was not a pre-packaged, government mandated, shiny collection of machines designed to impress customers. These were very smart, very efficient, small machines, each designed with the specific purpose of testing what the government considers to be the degree of safety that we can expect from any item we buy in a store today or receive as a promotional gift, as in our case. The visit lasted perhaps a couple of hours, but I left with a renewed sense of confidence knowing that our program was well within the scope of what we want to achieve: the knowledge that we are protecting our customers and their customers from unexpected dangers and that we are well on our way to achieve our best possible effort to guarantee that. ALPI has met and surpassed all applicable safety standards and regulations for the 26 years it has been in business. Alpi is also striving constantly to keep up with and abide by all legal warning and labeling requirements as established by the U.S. government and the Consumer Product Safety Commission. For 30+ years Alpi has imported goods from China, Europe and other countries around the world. We have always considered the safety and quality of our products a top priority. We have long standing relationships with our main suppliers. We visit their factories to insure that they continue to meet our standards. We will not do business with factories we believe are in violation of our policies or engaged in unethical conduct. We use SGS and other independent testing labs to confirm the safety and compliance of our products. Test reports are available on request for most of our items. If more recent or new tests are required we will order them for our customers. Because of the cost involved in constantly testing items we have been selling for years, buying them from the same trusted sources, we may have to refer our customers to older tests when it is not economically feasible to repeat the test. All test reports are available upon request. Decorating and printing inks used on Alpi products have been fully tested by our vendor in the USA and do not contain any toxic chemicals at any detectable concentrations. These test reports are available upon request. We will continue to monitor and abide by all new U.S. government regulations as required and we will continue to maintain our high quality and safety standards. In 2008 the Consumer Product Safety Commission (CPSC) adopted a new set of regulations designed to improve the safety of items intended for sale to and use by children under 12 years of age. This act is known as the Consumer Product Safety Improvement Act (CPSIA) of 2008. The aim of CPSIA is to protect children by reducing amounts allowed or eliminating completely Lead, Phthalates and other heavy metals previously used in products intended for children under 12 years of age. Other parts of the law are aimed at facilitating the enforcement of the law by making it easier to recall product in the cases where a recall would be applicable. However, the application of the law is still somewhat ambiguous while under development, even though the law is already in force. While Alpi has created and launched many fun toys and novelty items over the years, our products have always been designed and intended for use by adults. This is especially true now that Alpi is only selling to the Promotional and advertising industry. This does not exempt us from providing items that are non toxic at all times and under all circumstance, but it exempts us from certain new labeling requirements that are applicable only for items intended primarily for children under 12 years of age. Of these, the last three certainly do not fall under the description of toys and therefore are not subject to labeling requirements. Currently the CPSC regards stress relievers as products intended for adults. As such, stress relievers are not subject to tracking label requirements. However, Alpi is trying to go the extra step to make sure that we comply with all aspects of the new regulations, and it is making a serious effort to find out if and when our Squeezies® are being distributed to children. When we are handling the sale of our Squeezies®, all our paperwork, from Sales Order, to Order Confirmations, Invoices and even Paper proofs bears a statement that requires our customers to specify when the product is being intended for children under 12 years of age. If the primary intended users of our stress relievers are children under 12 years of age we will register each item in the PPAI database and print them with a non-removable tracking label. This requirement is necessary to comply with the CPSIA. An additional fee for printing this label will be incurred. Alpi is very aware of the necessity of maintaining high standard of production, labor conditions, and social and ethical behavior, not only within the confines of our Country but everywhere in the world. Therefore, we make it a point of working only with companies that abide by the most accepted international standards. We have passed, many times, audits of the factories we work with, and when we have found situations that did not pass or were not acceptable to us in general, we were quick in fixing them or discontinuing our relationship with that factory. Most of our relationships with vendors are long standing and we deal with new factories through agents that know our values and our needs for high standards. We have in house safety tests for the materials used in the majority of our products and we also require tests from the original manufacturers for all paints and inks used in the production and decoration of the products we sell. Our founder and other members of our staff visit regularly our factories and maintain direct visual, as well as informational knowledge about the workplace situations, the quality of the products and of the work environment. Clearly, we work with remote countries, where values and lifestyles are very different than our own, but we constantly strive to remain aware of what would be unacceptable behavior and conditions, both to us and to our customers in the USA and worldwide. If you have more questions about safety issues, or any other aspect of Alpi’s products, please feel free to ask any of our sales people or request to talk directly to other staff or management, including the President. You will never be turned down and your questions will be answered as quickly and correctly as possible. Both for national security and product safety concerns, legislations keep changing and getting more complicated. Alpi will strive to stay abreast of all these changes and to respond to all new requirements with the best of attitudes and as promptly as physically possible. Proposition 65 requires consumer product warnings for products shipped to California that may expose consumers in the state of California to a published list of carcinogens or reproductive toxins unless such substances are present in levels that pose no harm. (c) An exposure for which the person responsible can show that the exposure poses no significant risk assuming lifetime exposure at the level in question for substances known to the state to cause cancer, and that the exposure will have no observable effect assuming exposure at one thousand (1000) times the level in question for substances known to the state to cause reproductive toxicity, based on evidence and standards of comparable scientific validity to the evidence and standards which form the scientific basis for the listing of such chemical pursuant to subdivision (a) of Section 25249.8. In any action brought to enforce Section 25249.6, the burden of showing that an exposure meets the criteria of this subdivision shall be on the defendant. It is Alpi’s position that the light use of our promotional toys and novelties does not warrant the need for any labeling, because the exposure to any items included in the list of chemicals published by the state of California would be minimal both in frequency and amount. Since our products are tested for all major chemical toxic products and pass all tests with flying colors, it is our belief that any further labeling is unnecessary. This warning label does not automatically imply that you will be exposed to any chemicals, but it will ensure ultimate compliance with California Proposition 65 regulatory requirements. As a company started by its founder in his garage, Alpi is very aware of the personal efforts and sacrifice that it takes to achieve enduring success.